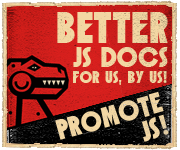 There has been a lot of talk about module systems in JS lately (especially within the SSJS group). This sounds really interesting. One might be able to circumvent some of the security problems by putting in provisions for also loading data from regular URLs and not only from the central repository. Well sure there isn't a good hosting service for JSAN but that doesn't make it a bad framework for defining modules. Joose doesn't treat itself as a JSAN distribution, I mean where is the META.json file? I am certainly not going to use Joose because it appears the people there haven't figured themselves out. Besides why include 40 kb of code when I can get all the useful features in 1 kb? Maybe if they supported JSAN so that you can load the extravagant features on demand.